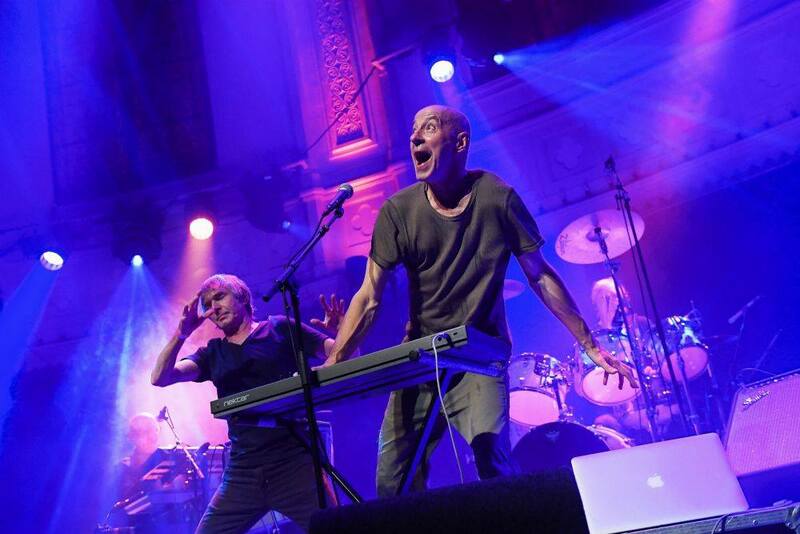 A great shot showing Marsh / Andrews / Baker in full form performing at the Paradiso in Amsterdam 23 / 09 /2017. The final gig of this year’s return to live performance with the aid of many old allies – Steve Halliwell (Keys) also in the background to be seen, The Syd’s i.e. Sarah and Wendy Patridge on Backing Vocals, Mike Cozzi (Gtr.) and on the Bass Scott Firth (PIL). Shriekback used the Kickstarter Platform to make this possible and played many tracks from 1985’s ‘Oil And Gold’, a few from ‘Big Night Music’ and some classic singles like ‘My Spine Is The Bassline’, ‘All Lined Up’ in updated versions but only one song from their recent ‘Without Fish And Strings’ album; ‘Recessive Jean’ which is not the strongest imho but worked fine as a medley with the incredible groovy ‘Feelers’. It was hard to tell who was more delighted that this happened, the band or the fans – a great night out in a great City. Thanks to modern tech nearly every move is documented somewhere but to have been there is actually still priceless.